The item Rubber egg kitchen experiment, (ebook) represents a specific, individual, material embodiment of a distinct intellectual or artistic creation found in Charlotte Mecklenburg Library. 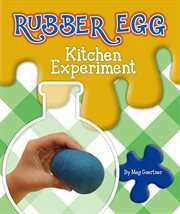 Engage readers with simple step-by-step instructions to create a 'rubber' egg right in their kitchen. Readers are introduced to basic science concepts such as acids, concentration, and life cycles. Additional features include a table of contents, informative sidebars and captions, a phonetic glossary, an index, information about the author, and sources for further research. A kid-friendly science experiment inspires observation and hands-on fun. Is it possible to bounce a raw egg without breaking it? Can something act like both a solid and a liquid? Engage readers in key science concepts using easy and fun science experiments that can be done right in the kitchen. STEM concepts are broken down and explained with simple text, colorful photographs, and step-by-step instructions for completing experiments. Additional features include a table of contents, informative captions, a phonetic glossary, an index, and sources for further research. Readers will enjoy actively participating in the experiments and understanding the science behind how things work. This engaging series is perfect for young scientists!